For many years, Arrow has honored our customers’ wishes regarding green cleaning. Now Arrow has formalized its “green” cleaning program under the name Arrow GreenCare℠. The Arrow promise to its Arrow GreenCare customers is that all their cleaning will be environmentally friendly. To that end, Arrow employs the siloxane silicone method known as GreenEarth®* which has been extensively tested as an earth-safe process. Arrow also uses an alternative method, that manages “green cleaning” through a professional wet-cleaning system using special surfactants and water temperature with limited agitation, to achieve a healthy clean garment. Fortunately, the dry cleaning industry has evolved sufficiently that we can now offer the public two fine alternatives. 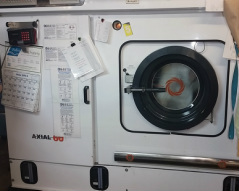 Any customer requesting green dry cleaning can be assured that their garments will be processed in either GreenEarth siloxane solution or in Arrow's professional wet cleaning solution, using water as the primary solvent, with earth-friendly surfactants doing the soil extraction in sophisticated, computer-controlled machines. These special wetcare machines are designed to extract deeper soils while agitation and abrasion are kept to a minimum. In an effort to further protect your garments, Arrow introduced the re-usable Arrow GreenCare transport bag. It serves a dual purpose, depending upon its configuration. It is convertible as a convenient bag for transporting your clothing TO Arrow. When your garments are clean, the GreenCare bag converts to a covering for your clothes. If you are among the many who find wire hangers collecting on the closet floor or in piles destined for the trash, Arrow will take them in and recycle them. If bagged, we will accept them at our counter location on Troost. We will pick them up from our residential route customers if they are bagged separately from the clothing and marked for pickup. We also provide wire hanger recycling caddys. Green technology continues to be very important here at Arrow, so we took advantage of the opportunity presented to us from Brightergy to install solar energy panels on the roof of our 26,000 square foot main facility. It made perfect sense for us. Thanks to Brightergy, a grant from KCP&L, State and Federal tax credits, this investment was clearly a no-brainer! The payback on our investment began immediately, once the system was hooked up, and put online by KCP&L. 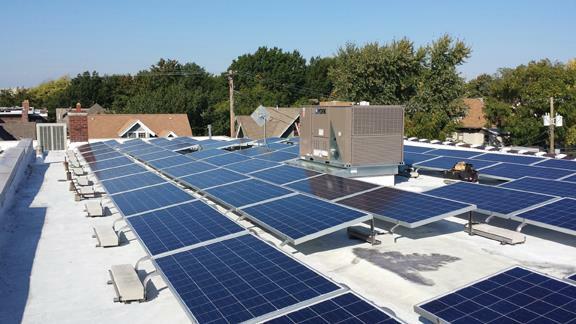 We have been a participant in KCP&L’s Demand Response Incentive program M Power, since 2008, but the solar energy project presented a far greater opportunity for us to help the environment, while also helping us control energy costs. We are continually looking for ways to make our business more environmentally friendly, through instituting green cleaning systems, such as GreenEarth solvent, and new wet-cleaning systems, also by lowering our water consumption, recycling of paper, cardboard, poly bags, plastics, etc. We have upgraded equipment for greater efficiency, such as our new low energy lighting system in 2010, and our new high efficiency boiler in 2011 which improved our natural gas usage by 50%, to help control our costs of doing business and in addition to that we get to help the environment, what a great win-win! Now as we enter our 100th year in business, our future is looking brighter than ever!